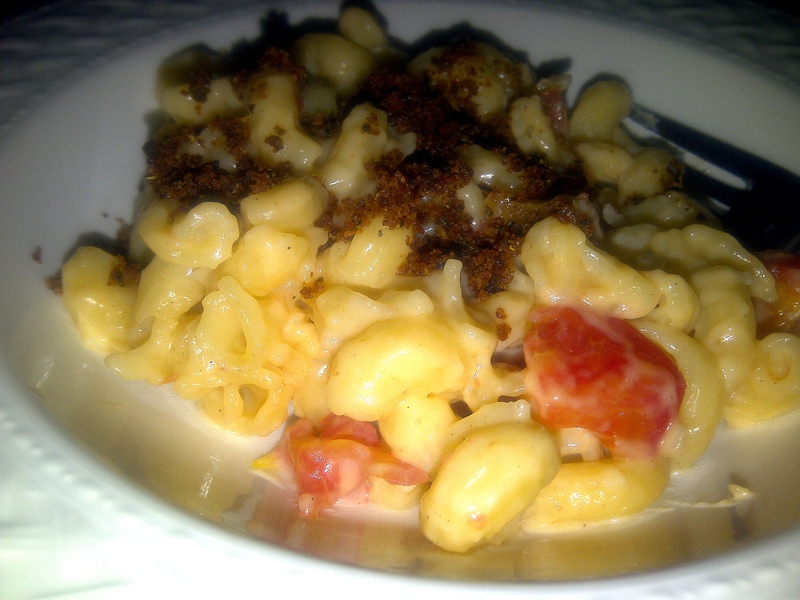 So in absolute defiance, I went home and made Macaroni and Cheese, also known as Mac ‘n’ Cheese. I know you’re thinking that I should listen to my doctor, and I will. I think above all else we must look after our bodies, they are after all, the fine and gorgeous vessels we carry around… well at least mine is! Actually, I was reminded of a story I read the other day about Paula Deen – queen of Southern cooking! She was diagnosed with type 2 diabetes a while ago. For me, Southern cooking is all about feeding your soul with comfort and in many ways it is cooking food in it’s excesses. It is hard not to love comfort food, but there is a line that must be drawn. Food is not meant to hurt your body, so when it does, you got to eat right folks! Anyway, here is my Mac ‘n’ Cheese recipe. I did it on the stove top. Get a large pan of salted water on the boil. Melt the butter in a large ovenproof saucepan over a low heat, then add the flour and turn the heat up to medium, stirring all the time, until you get a paste – this is your roux. Add all the sliced garlic – don’t worry about the amount because each slice will caramelise in the roux. Keep cooking and stirring until golden. Add the bay leaves and slowly whisk in the milk (I used skimmed milk) a little at a time to ensure you get a nice smooth sauce. Bring the mixture to the boil, then leave it on a low heat to simmer, stirring occasionally. Add the pasta to the pan of boiling salted water and cook according to the packet instructions. Meanwhile, roughly chop the tomatoes on a board and season them well with salt and pepper – the doctor would be happy with that one! Drain the pasta and add it immediately to the sauce. Give it a good stir and take the pan off the heat. Stir in your grated cheeses, chopped tomatoes and thyme leaves, if you can’t find fresh thyme leaves, dried work fine too. Add a dash of Worcestershire sauce, and a pinch of nutmeg. Taste it and season it. Cover and leave for 10-15minutes. If you want to use your oven, throw the pot in at 170°C for 10-15minutes. Serve up the mac ‘n’ cheese with the breadcrumbs sprinkled on top. I also served it with a salad.